The UK’s poor productivity performance has been and continues to be the source of a great deal of attention for economists, policy makers and commentators alike. Many theories have been put forward as to what is the cause of this poor performance, ranging from low interest rates keeping ‘zombie firms’ in business to inaccurate measurement of the economy. But none seem to fully explain the problem. One of the issues that has received relatively little attention in this debate is the geography of productivity. The purpose of this briefing is to show the huge variation in productivity across the country, and what it means for both the Government’s Industrial Strategy and the Chancellor’s Budget as they attempt to improve the country’s lacklustre productivity performance. But this masks the large differences in productivity across the country. What the Chancellor didn’t say is that the Greater South East (GSE) is actually more productive than the German average – in 2015, a worker in this part of the UK produced around 7 per cent more per hour than her German counterpart.1 And this part of the UK is one of the most productive areas of Europe. But even this split by region hides variation – splitting the Greater South East and the rest of the country into urban and non-urban shows further interesting differences. As Figure 1 shows, the non-urban parts of the Greater South East are more productive (measured in terms of output per job) than their non-urban counterparts elsewhere – 18 per cent to be precise. If the latter was as productive as the former, the national economy would be £68 billion larger. But this difference is dwarfed by differences between cities. Cities in the Greater South East are 44 per cent more productive than they are elsewhere. 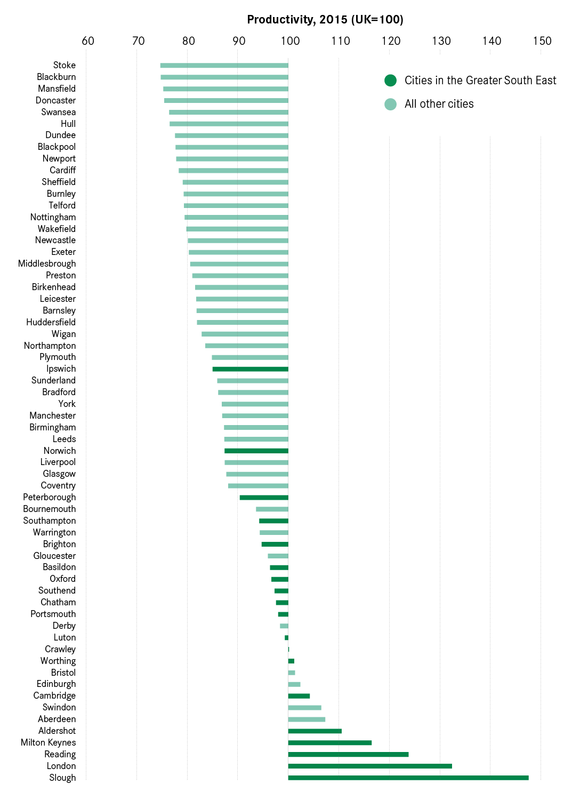 And if all cities were as productive as those in the Greater South East, the economy would be £203 billion larger. This is equivalent to four extra city economies the size of Birmingham. That so many cities outside of the Greater South East perform poorly is a big issue for the national economy. Economic theory predicts that cities, and big cities in particular, should lead national productivity. This is because concentrating jobs and businesses in specific places leads to them being more productive – a process known as agglomeration. While this is the case in the USA and Germany in particular, as Figure 2 shows, it is not the case in Britain – 50 of 62 cities were below the national average productivity in 2015, including big cities such as Manchester, Liverpool and Birmingham. And of the 12 that were above the national average, eight were in the Greater South East. To understand why this is the case, we have to look at the performance of different sectors and how this varies across the country. Not all sectors make the same contribution to national productivity. Figure 3 looks at the productivity and employment shares of different broad sectors for cities in the Greater South East and in the rest of Britain. There are two things to note. Note: Sectors are ordered according to their productivity at a national level. Agriculture excluded because of its very small representation in cities, and real estate is excluded because its much greater size masks the patterns of other sectors. See our interactive tool which offers a city-by-city break down of productivity across the country. The second is that the performance of these sectors plays out differently across the country. 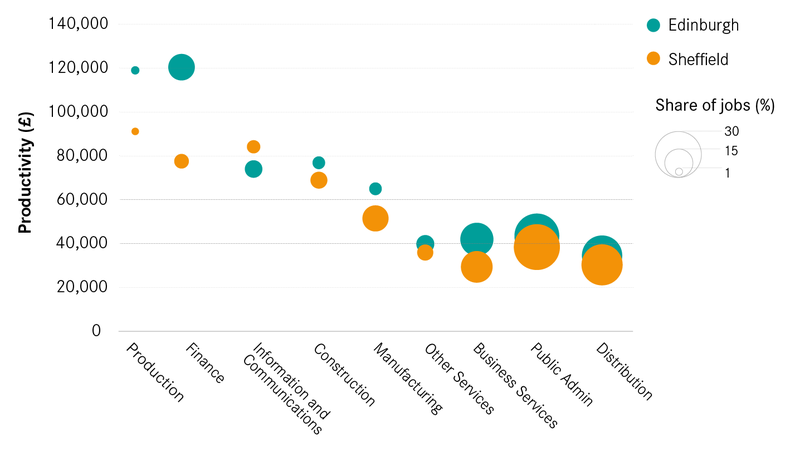 In every case, those industries more likely to export are more productive in cities in the Greater South East than elsewhere, with particularly marked differences in finance and information and communications. But not only do these more productive industries tend to perform better in GSE cities, the information and communications and finance sectors also employ more people too. So as well as these industries being more productive in GSE cities, they employ a larger share of people in these more productive jobs too. Box 1 shows how differences in productivity and employment play out across sectors in Reading and Hull, while Box 2 does the same for Edinburgh and Sheffield. The difference in performance between Reading and Hull reflects the differences in performance between cities in the GSE and elsewhere more broadly. 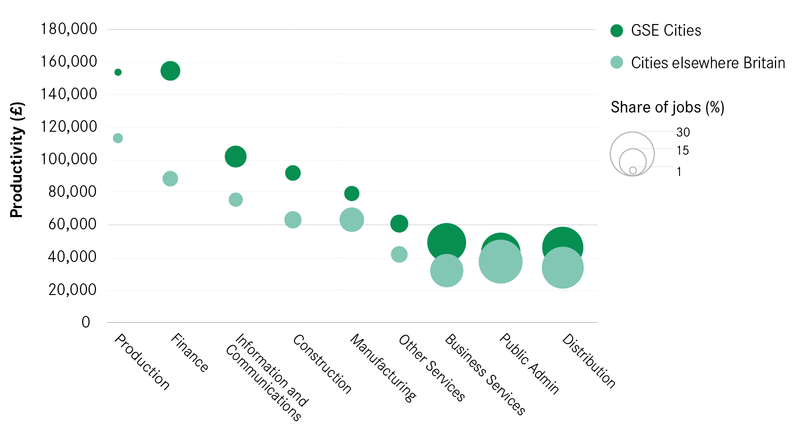 As Figure 4 shows, all sectors are more productive in Reading, with particular differences in information and communications. And looking at the exporting sectors as a whole shows that these activities are twice as productive in Reading as they are in Hull – a worker produced on average £113,000 in the former compared to £66,000 in the latter in 2015. Data for all cities is available on our interactive tool. A particular exception to this is manufacturing. It is more productive in GSE cities, as is the case for other exporting sectors, but it accounts for a much smaller share or jobs – 3.5 per cent compared to 9.2 per cent elsewhere. This suggests that the more advanced manufacturing becomes, the fewer people it employs. The implication is that the role of manufacturing as an employer will reduce further as it continues to become ever more sophisticated. While the majority of cities elsewhere in Britain trail the national productivity average, Edinburgh is one of the few exceptions. Figure 7 compares the sector productivity of the city to Sheffield, which in contrast performs some way below the national average. The main difference between the two cities is in finance – not only is finance much more productive in Edinburgh (£120,000 against £77,000), but it also accounts for a much larger share of jobs too (10.7 per cent against 3.3 per cent). Information and communications is the only broad sector where Sheffield outperforms Edinburgh. Of all the broad sectors, this is Sheffield’s strongest relative to other cities, placing it 17th out of 63 cities. The weaker performance of cities outside the GSE results from their struggles not only to attract sufficient jobs in more productive sectors, but also their ability to attract the higher-skilled components of these sectors. Figure 6 plots the productivity of those sectors most likely to export against an estimate of the share of jobs in exporting sectors that are in high-skilled occupations.5 It shows that those cities with more productive export sectors tend to have greater share of export-facing jobs in higher-skilled occupations. 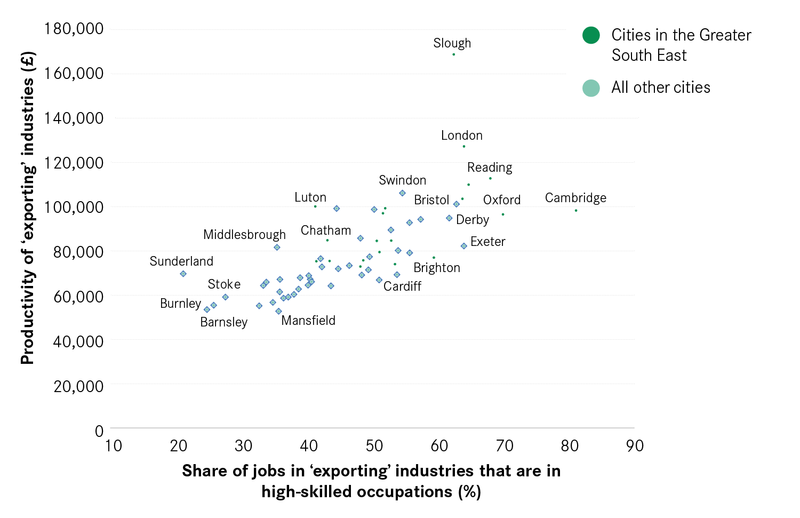 And those cities with higher shares of higher-skilled occupations in their export bases tend to be in the Greater South East. This splitting of functions doesn’t just happen within industry – it happens within firm. For example, Barclays has operations in both London and Sunderland. 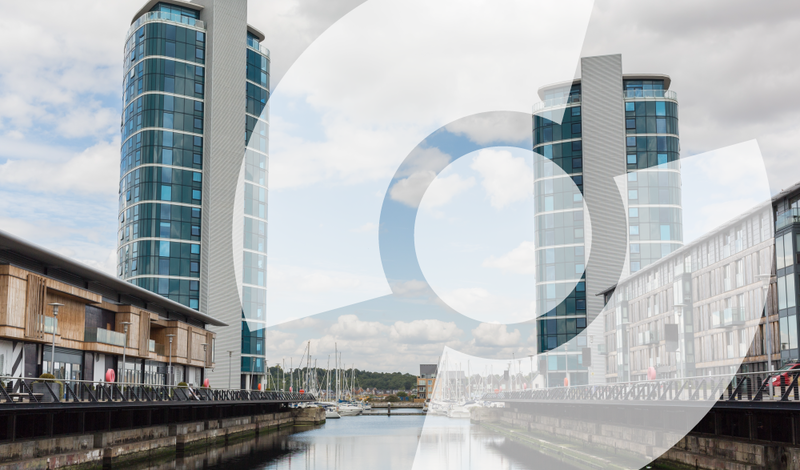 In London it undertakes its high value investment banking activities, while in Sunderland it operates a call centre. A similar pattern is seen for Nissan, which does its car assembly in the city, but has its design activities based in Paddington. ASOS has its headquarters at Kings Cross rather than at its large distribution centre in Barnsley. And Siemens is due to open a new wind turbine facility in Hull, but its headquarters are in Aldershot. While the location of a local services business is driven by where there is a market, exporters aren’t inherently tied to any specific location. This is because exporters by definition sell beyond a local market, and so in theory they could set up anywhere. As the examples above show, the optimal location for different parts of the same business is not the same – broadly speaking, higher-skilled elements of an exporting industry have chosen to locate in GSE cities, while lower skilled elements have located elsewhere. As set out in our briefing ‘Why don’t we see growth up and down the country?’, the split in operations of the same industry across the country occurs because of the relative benefits that different places offer. London, for example, offers businesses access to lots of skilled workers and access to lots of other high-skilled businesses. Businesses are prepared to pay a premium to base their high-value activities in London, as shown by their willingness to locate in one of the most expensive places in the world to do business. Cities like Sunderland, Barnsley, and Hull don’t offer access to knowledge in the same way. But they do offer access to lots of lower-skilled workers and cheaper land. And this makes them attractive to more routine manufacturing or services activities. The result is that their export bases are less productive than those further south, and this has implications for the productivity of their economies as a whole. The ability of Reading and Hull to attract business investment rests mainly on the specific benefits that they can offer businesses. Figure 7 sets out how the two compare. It shows that what Reading offers is access to knowledge – both in terms of high-skilled workers and a more dense city centre (as well as easier access to London), but this comes at a cost. What Hull offers is access to lots of lower-skilled workers and much cheaper land. Reading’s offer therefore holds greater appeal to higher-skilled economic activity that requires access to knowledge, while Hull appeals more to lower-skilled activities that don’t need access to knowledge, instead looking for a low cost location. As a knock on, the success of a city’s export base impacts upon the success of its local services businesses. Because exporters sell to markets beyond the city they are based in, they bring money into the local economy in the form of wages and profits. This in turn increases demand for local services. But as shown above, this is more likely to translate into an employment effect in these sectors rather than deliver a productivity boost. What it does mean however is that while exporters don’t employ a large share of people directly, indirectly they are likely to sustain a number of jobs in local services through a ‘multiplier’ effect. Given the more productive nature of Reading’s export base compared to Hull’s, for example, this multiplier effect is expected to be larger in the former. 1 Greater South East is defined as the regions of London, South East and East of England. 2 Eurostat, Gross value added at basic prices by NUTS 3 regions; Eurostat, Employment (thousand hours worked) by NUTS 2 regions. Data is for 2014. 4 ONS, Blue Book; ONS, Workforce jobs. 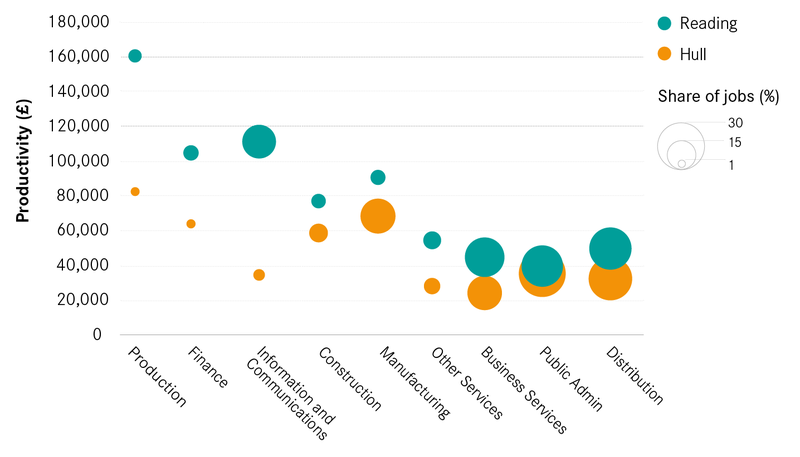 5 Sectors in the Annual Population Survey are grouped differently as to how they are presented in the productivity data. For this reason the definition of exporters is slightly different in the occupational data, defined as the broad sectors A,B C, D, E, H, J , K, L , M and N. Defined as BDE Production other, C Manufacturing, J Information and Comms and K Finance.